« Ticket to Ride Nordic Countries – coming back again! Frightful pumpkin trains and spooky stations are scheduled to arrive just in time for Halloween with a new add-on for the Ticket to Ride Series – the Halloween Freighter. This new set of custom-sculpted trains and stations includes 45 new orange-colored Pumpkin Trains and 3 spooky Halloween Stations. 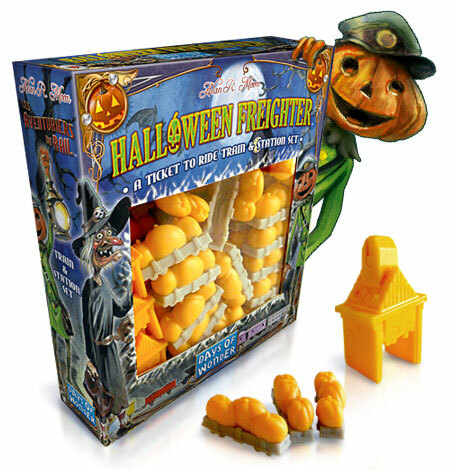 It’s a Halloween treat for Ticket to Ride fans worldwide that can be used as a replacement train set for any of Ticket to Ride game or map collection. The Halloween Freighter is a limited edition Train & Station Set and is expected to be available in game stores worldwide the week of Halloween for the expected retail price of $12/€10. This entry was posted on Monday, October 1st, 2012 at 14:01 and is filed under Events, Games, News, Ticket to Ride. You can follow any responses to this entry through the RSS 2.0 feed. Both comments and pings are currently closed. Will these limited edition set be available at Essen? ZOMG! I must get this. Is there a pumpkin scoring marker included as well? no, no custom pumpkin marker; we recommend you either use one of the spare pumpkin trains (we did put a bit more than 45 trains in each box, just to be sure) – or the score marker of the color your pumpkin trains are replacing. OK, I just happen to know a Halloween enthusiast who loves Ticket to Ride. How can I get these? I need them for a Halloween party! Will look great with Alvin and Dexter on the board. Any more TtR surprises coming up? I can find thé halloween freighter? Your regular game dealer should have it. And if not, since this expansion is truly language-independent, it should be fairly easy to locate other sources. Also, completes the colour set, in terms of having had 8 colour cards but only 7 corresponding train colours.